Our Luxury hostel opened in April 2014 and already guests are raving about us. It has been designed to give you the best possible comfort and fun. All Rooms have FREE WIFI access. All beds have private lockers, private night lights, USB charging points and power point. SECURITY: 24hrs Reception, No curfew. Security electronic swipe cards for all rooms, CCTV throughout and security passes issue to all our guests. Security lockers provided for every bed. MODERN ROOMS: All rooms have wifi access, USB charging points at each bed, Private bed lights. Bunks have been designed to give Max headroom and mattresses are Hotel Superior quality. Fresh clean bed linen provided Free of charge. KEEP IT CLEAN – Our bathrooms and kitchens are constantly monitored for cleanliness. We pride ourselves on our cleanliness. FREE LUGGAGE STORAGE: If you arrive before check in time - our check-in starts at 1 pm! Check out is by 10 am. 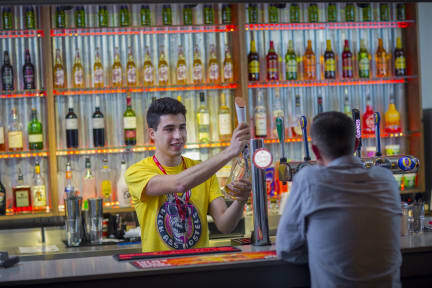 AWESOME FRIENDLY STAFF; they are friendly and will tell you all the best places to go – and more importantly, where not to go! 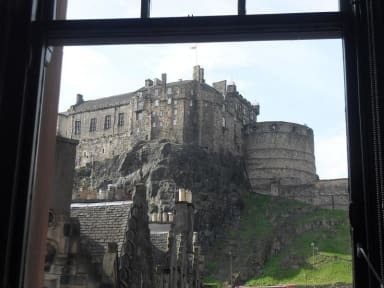 Brand New - CHILL OUT ROOM: Hang out in our brand new chill out area designed for comfort and relaxation, sit back and relax at the amazing views of Edinburgh Castle next door. Our motto is 'LIVE LIFE TO THE FULL', and we mean it. So what are you waiting for? !! Great hostel! Superb location, facilities, staff, comfy bed, highly recommend. Had a really good time, would recommend. Delightful hostel with a great location. Loved that there were individual lockers and the place was kept really clean. Staff were not friendly or overly helpful. Definitely recommend. Our room was nice and spacious but there was just a few things about our stay that bothered me. The bathroom smells horrendous. It must be full of mildew. I had to hold my breath every time I went in. People were coming into their rooms all through the night and even though I had a private room I could hear them because they were so loud and the doors were constantly being slammed. I could also hear everything going on outside it was as if there were no window at all. Definitely an olderhostel. Stayed in a pod room, which was good for privacy. The pod beds were much more spacious than expected and lockers were a good size. Staff were very friendly and the hostel was clean. The showers got quite dirty quite quickly due to the large amount of people using them, but if you used them soon after they were cleaned it was fine. Most people kept to themselves but the hostel does have nightly events to encourage meeting others. My friend was really ill and was being sick. She was first of all accused of being drunk by a member of staff at reception. They also said there was nothing they could apart from call an ambulance, when I asked if they had a 111 service. The showers were freezing cold and the heating was on full blast when there were 8 of us in the room. When I went to breakfast they had also ran out of most of the things on the menu. Overall service poor, however it was a great location.